Asking questions is a communication skill that will help foster healthier relationships between leaders, managers and co-workers. Intelligent questions stimulate, provoke, inform and inspire. Questions help us to teach as well as to learn. Asking questions is not a sign of weakness or uncertainty, but a sign of strength and intelligence. Successful leaders constantly ask questions and are well aware that they do not have all the answers. Gary Langsdale, University Risk Officer shares his ‘Top Ten List for Better Communications- Asking’. Try This: Practice asking more questions in your everyday conversations. Choose two individuals in your group and conduct stay interviews. Use some of the Questions to Ask Your Employees, and draw upon the previous building rapport and listening skills learned earlier. 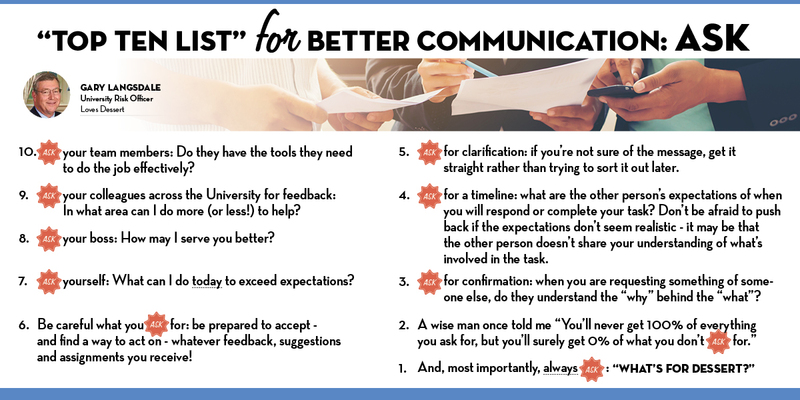 Try This (Bonus): To get feedback on your leadership effectiveness, try asking some of these Questions to Get Feedback. Please share these tips with your leadership teams and thank you for your continued support of Taking Action.